It seems that most marketers have accustomed to Facebook Ads but the same cannot be said about LinkedIn ads. Yet! LinkedIn Ads provides an exceptional way for B2B marketing in order to generate new leads and reach the decision makers directly. The same can’t be said about Facebook. With over 120M total users, 40M of which are from USA, LinkedIn has become a considerable platform for advertising. 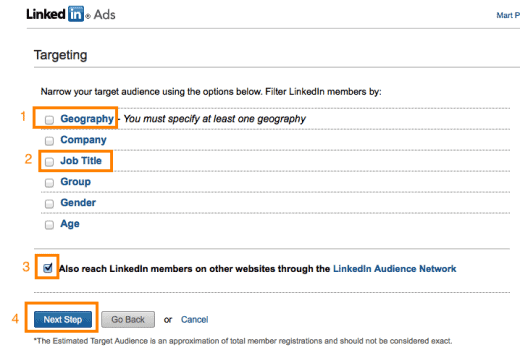 Consider using LinkedIn ads if your targets are other businesses or you are recruiting for specialists in your field. First of all, you need to access LinkedIn Ads page and create a new campaign. 1. Set up a name for your campaign. 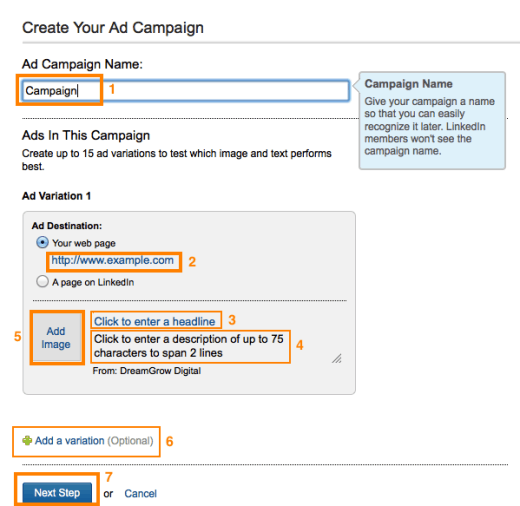 If you run multiple ads, it’s recommended to use distinctive names for each campaign. 2. Choose the desired landing page. This is where you want the user to go to. Always use a dedicated landing page for your campaigns. This will give you a lot better conversion rate. 3. Add an appropriate headline for your ad. Clear and distinctive. You are limited by 25 characters (that’s including spaces). This is where you grab the attention of your target audience. So, make sure headline is truly relevant for them. 4. Enter the body copy of your ad. This is where you tell them why they need to click. Body copy should feature a strong call-to-action. You are limited by 75 characters including spaces, make them count. 5. Add a picture. LinkedIn recommends 50×50 pixel thumbnails and it will format all larger pictures to fit the size. Make the text and image easy to read. 6. Add a new variation of the same ad campaign. I highly recommend making more than one variations and keep them rotating to test which ones work better than the rest. Throw out the ones that are not working and create new ones. Details to play around with: picture, headline, copywriting text, different call-to-actions (eg “buy” vs “purchase”). In the long term, running multiple variations will help you reach lower CPC and increase your CTR percentage. 7. Well done! You can now continue to the next step. 1. Target by location. This is a must with LinkedIn. You can choose multiple locations but I recommend creating a new variation for each geographic location in order to see where your ads are working better and where they are failing. This information can be used to tweak your ad campaigns. 2. Specific targeting. Users can target companies, by job titles, groups, gender and age. Where exactly is your target audience? Do they tend to belong to the same groups (such as online marketing, internet marketing, e-marketing, etc) or maybe you want to target them by job titles? You can segment your target audience by job titles. 3. Target via external LinkedIn Audience Network. LinkedIn has a network of partner networks where the ads can be displayed. You can find more detailed information here. 4. Congratulations. You have now targeted your specific audience. 1. Choose a payment method. 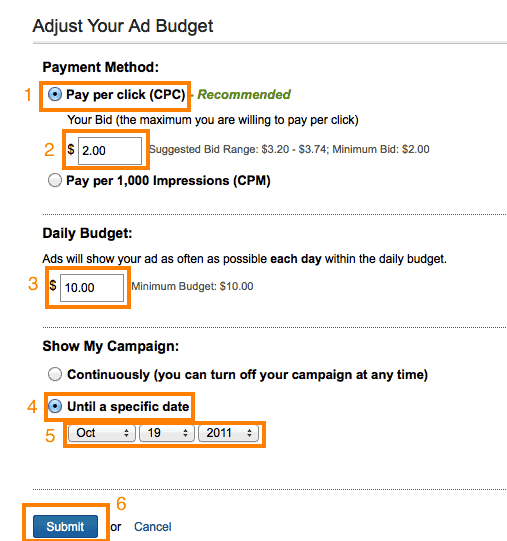 It is highly recommended to use PPC (Price per click) method. As the name suggests, you payfor clicks and not the amount the ad has been displayed. 2. Set a bid price. This is what you’ll be bidding against other campaigns targeting the same terms (location, occupation, age, gender, groups, companies) as you. I suggest starting out low and test if the targeted specifics have a lot of competition. More competition for certain terms means higher bids. 3. Set your daily budget. This is for your budget for the day. If you’re new, I recommend starting low and test the waters. 4. Choose your campaign dates. You can keep the ads running continuously and pause at any given time or you can choose a specific end date. 5. Enter the end date. 6. Submit your ad. Don’t forget that you still need to enter your billing information. Ad campaigns require continuous work and testing. You are never completely done with them. Keep testing and improving your Click-Through-Rates! I also suggest reading LinkedIn Ads guidelines. I have my campaign links pointing to a generic redirect program that logs the ip address, the campaign name, and then it sends the user to the appropriate marketing page. I have noticed that there are a fair number of IP addresses that are coming from a click on linked in that are owned by and registered to Google. Is Google crawling LinkedIn’s ads for competitive reasons? I’m paying on average about $5 a click, and I’ve reached out to LI to ask about refunds on these clicks that are clearly Google and not an individual IP address, but have heard nothing back. If you spend less than $25K, they don’t give you support on Ads. They just created a new group for Advertisers, and I’ve joined it, but I’m not happy about paying for clicks that are not legitimate. Has anyone else noticed this? Thanks, Don! LinkedIn marketing will definitely be on the rise next year! Nice post Mart! Was just doing some research for a post I’m doing for a client and randomly came across it in search results – 1 backlink coming your way.. Thanks, Daniel! I appreciate it. I’m actually re-writing it as I missed the part about link tagging when I originally wrote it.